I was literally like a small child on Christmas Day. 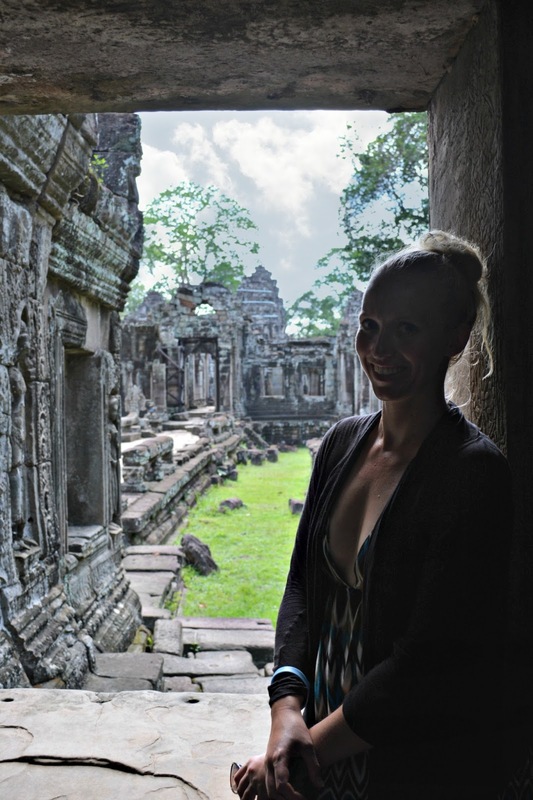 As excited I was for my entire holiday, the Angkor Temples were what I expected to be the highlight of my trip. Ever since I was little I had dreamed of visiting the iconic temples from Indiana Jones. I dreamt of running around the temple like Sheldon Cooper stealing the extra footage of Raiders of the Lost Arch, singing the theme song, and Kronwalling anyone who happened to get in my way. Thankfully I remembered I’m an adult and something like this would be highly frowned upon. But that still didn’t stop me from singing “do do do doooo do do doo” whilst occasionally skipping around the temples. Our flight got into Siem Reap around 11 which was the perfect time. I was sure that we wouldn’t be able to see the temples on the first day of our journey and was trying to think of things we could do until I was able to pretend to be an archaeologist. To my amazement and shock, upon arriving at our guesthouse, we were told that we absolutely had enough time to do the small circuit of the temples. Obviously, we said yes and quickly made our way to the Angkor Temples. We first started off by getting our 3-day access pass to the temples. This was a fairly easy process. And didn’t take much time at all. The buildings were gorgeous but unfortunately, I didn’t think to take any pictures of the facades. To be honest, I was more concerned about finding an Indiana Jones hat to add to my temple experience. From there we headed to the temples. This was the first stop on our circuit. 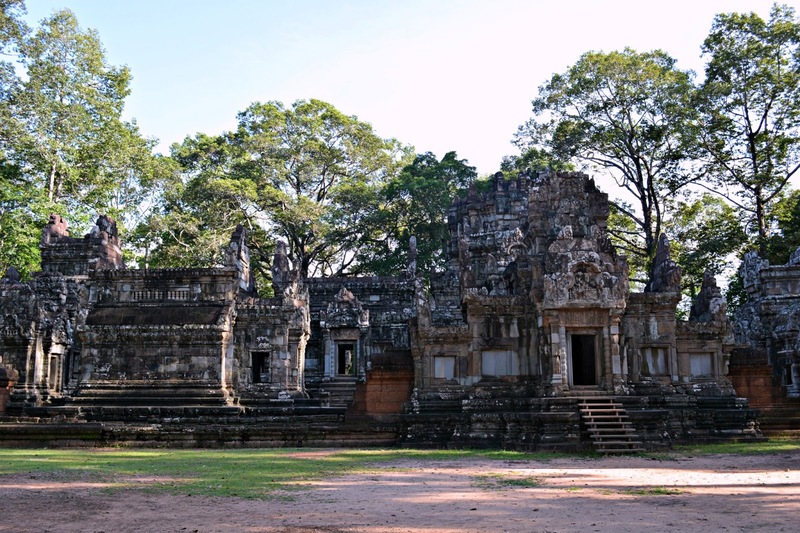 Unlike many of the temples in Angkor, Banteay Kdei has not been restored. This allows one to totally be engulfed with how this temple has withstood the test of time and the elements. 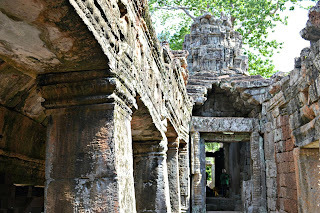 This temple was built by Jayavarman VII in the mid 12th century. One of the first things that stood out to me was that no tuk-tuks or motorised vehicles were allowed past the gates of the temple. Once inside the gateway, we were greeted by locals trying to sell various goods. Occasionally they would become quite aggressive with their sales, especially the smaller children. But once you said no, they would leave you be. Once inside the temples, these salesmen disappeared. They’re not allowed to sell goods within the temples which made the temples much more enjoyable. There were so many areas to this temple, it was very easy to become lost in amazement. The temple that sparked the trip to Cambodia in the first place! Built in the late 12th century, Ta Prohm was originally named Rajavhara. King Jayavarman VII built this temple to be a monastery and university. The beauty of this temple is that it is still (mostly) in its original state. Nature has shown just how powerful it is by slowly taking over the temples. Restorations have begun on the temple but they plan on leaving the impressive trees where they are. Out of all the Angkor temples, Ta Prohm is probably the most famous. It can be seen in both Indiana Jones and Tomb Raiders. Ever since I was little, after watching Indiana Jones, I knew I wanted to visit the temple from that movie one day. Dreams really do come true! This was definitely one of the smaller temples that we saw during our trip. Thommanon was built in the early 12th century by Suryavarman II. This temple was built in dedication to Shiva and Vishnu. There is only one large structure that makes up this temple but it is sectioned into smaller areas. To be honest, as it was a smaller temple, we didn’t spend much time here. I spent a few minutes capturing a few photos of the detailed carvings before we headed to Chau Say Tevoda. With each temple, I tried to capture the differences in the carvings. No two temples had the same. As each temple was dedicated to a different cause, all the carvings were unique. I’m honestly kicking myself for not taking a photo of each temple sign before entering the various temples. Now that I’m writing and editing everything weeks after my trip, it's becoming increasingly difficult to remember which photos go with which photo. In saying that, if I’ve switched around the photos for Chau Say Tevoda and Thommanon, I deeply apologise. This temple was built in the mid-12th century by Dharanindravarman, Jayavarman VII’s father. Again, as this was a smaller temple, we did not spend much time here. 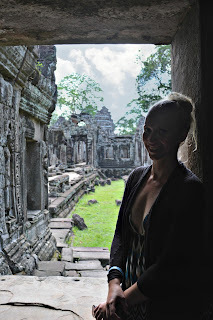 It was easy to navigate around the smaller temples, snapping pictures of the intricate (or what is left) carvings. This was probably the most intriguing and creepy temples of them all. Built in the late 12th century by Jayavarman VII, this temple originally built as a Buddhist temple. After his death, Hindu influences began to seep into the temple. 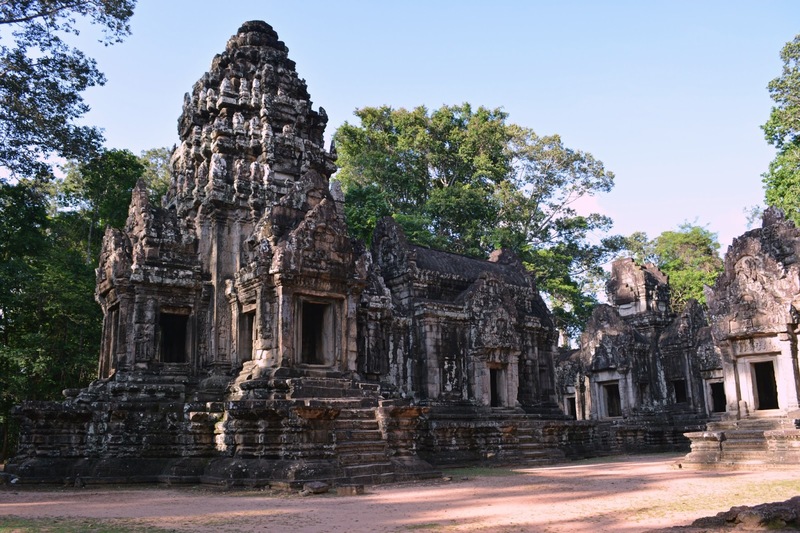 Some believe the faces carved into the temple are the face of Jayavarman VII whereas others believe the faces belong to Avalokitesvara or Lokesvara. There are over 216 giant faces carved into the facade of the temple. This temple was complete memorising! I could have spent hours here looking at the various galleries and carvings. The temple where I learned why one should NEVER wear a dress to Angkor. This temple was built by Jayavarman V and was the first temple to be built entirely of sandstone. This temple consists of 5 buildings and it built in a step pyramid fashion. Renovations to the temple have made access to the higher levels easier (ie., wooden steps with hand rails) however, I wanted to actually climb the steps. If you’re visiting the temples, I strongly suggest good walking shoes and wearing pants. This way you do not have to worry about getting knocked back from a temple for having too short of shorts and you do not have to worry about slipping on your skirt and falling down incredibly steep stairs. 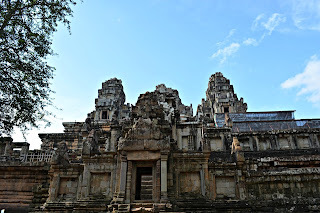 Angkor Wat is part of the small circuit but we decided to save it for the following morning. Angkor Wat during sunrise is a must do. It has been incredibly difficult choosing just one picture for each of these temples. Each temple is different, with extremely intricate carvings making them unique. Be sure to keep an eye out for guided photographic tours of each temple. I will go into more detail about each temple in those posts. 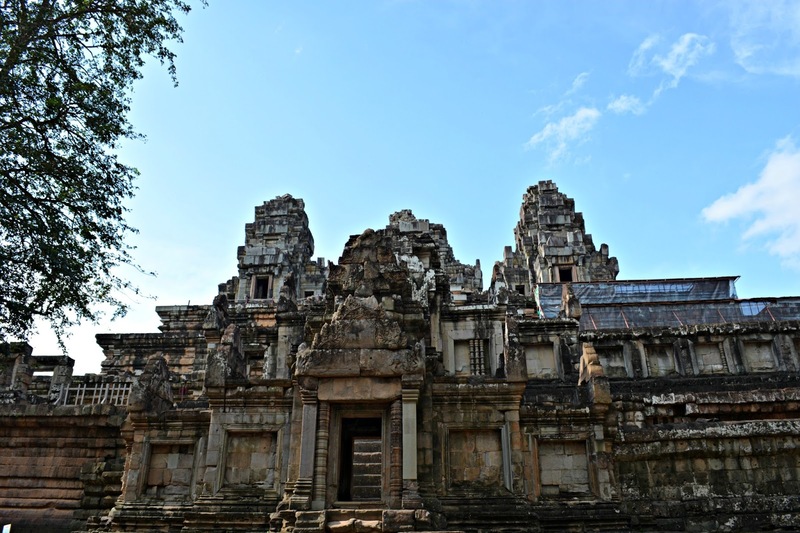 Until then, have you ever been to the Angkor Temples? Which of the temples was your favourite? Let me know in the comments below. Wow photos and blog are stunning and amazing! :D I wish to visit some of this temples! Thank you! I hope you're able to visit one day! Great stuff. I visited a couple of years ago and also got the 3 day pass. There are just too many temples to see in a short space of time - much better to spread them out. I was expecting a mega tourist trap but in the end I enjoyed the experience much more than expected. Would love to return again one day. I was afraid it was going to be a tourist trap as well. But I was so in awe of all the temples. You're right. You definitely need more than one day to see them all! Thank you! I'm glad to hear that! Cambodia is amazing. Beautiful photos and details. I didn't know they couldn't sell inside the temples. Thanks for the tip. Thank you! I was very happy to hear that they weren't allowed to sell inside the temples. It allowed for some peace to fully absorb the details of the temples. Cambodia is so amazing. Glad you enjoyed it. Wow.. Seems you had a great spiritual journey. Thanks for detailing out the history of each temple and letting us know what to expect. Will definitely read your post on Angkor Wat. You definitely should plan a trip to Cambodia! It is amazing! Thank you so much!